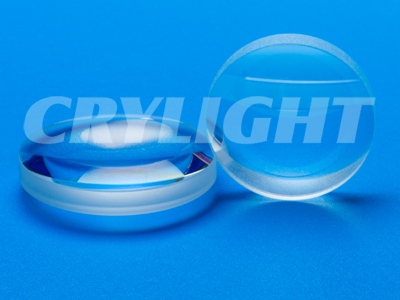 Spherical Lenses | CRYLIGHT / CRYLIGHT Photonics, Inc. | レーザー機器　専門商社｜株式会社アルクゥズ　ALQUZE Inc.
An axicon lens is a specialized type of lens which has a conical surface. An axicon images a point source into a line along the optic axis, or transforms a laser beam into a ring. It can be used to turn a Gaussian beam into an approximation to a Bessel beam, with greatly reduced diffraction. Axicons lenses are used in atomic traps and for generating plasma in linear accelerators. They are used in eye surgery in cases where a ring-shaped spot is useful. Axicon lens is usually characterized by the ratio of the diameter of the ring to the distance from the lens tip to image plane. If you need better than 60/40 surface quality, please send us the request freely. Achromatic lenses are doublet systems consisting of one crown and one flint element, cemented together along a matching curvature, so that white light coming into the lens is all focused (imaged) at the same point on the other side of the lens.They are designed to minimize spherical and chromatic aberrations for infinite conjugate, visible spectrum imaging applications. When used on-axis, an achromatic lens focuses an parallel input beam to a perfect “point”, limited only by the effects of diffraction. This performance can be achieved over a broadband of wavelength. 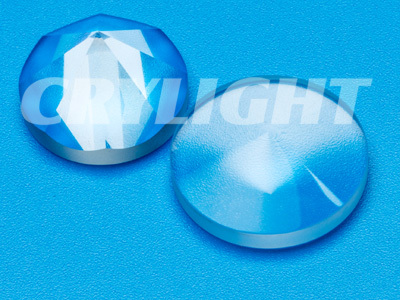 Achromatic lenses can be used to collimate and focus laser beams. They can also be used for high-quality imaging on-axis. However, the off-axis performance is significantly worse than the on-axis performance. If your application requires good optical performance off-axis as well as on-axis, multi-element lenses. 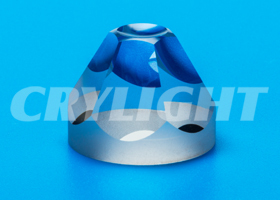 CRYLIGHT is dedicated to manufacturing high precision spherical lens from rapid prototyping to volume production. We have years of experience in lens manufacturing, design and optical presision assembly. The Plano Convex Lenses are made from BK7 material. It presents a curved interface and a planar interface. They are for instance the microlenses situated on top of a wafer, but can also encountered in macroscopic optical systems. Their asymmetrical nature influences their properties of bending the light. Depending on their role in an optical system, their orientation has to be taken into account. 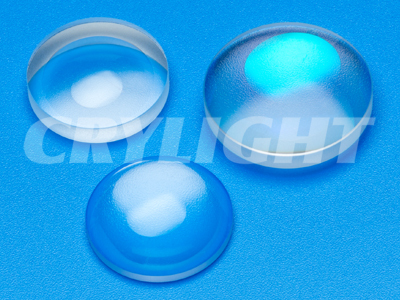 The Plano Convex Lenses are made from Fused Silica material. It presents a curved interface and a planar interface. They are for instance the microlenses situated on top of a wafer, but can also encountered in macroscopic optical systems. Their asymmetrical nature influences their properties of bending the light. Depending on their role in an optical system, their orientation has to be taken into account. The Plano Convex lenses are made from Sapphire material, which are manufactured with one concave surface and one plane surface. These lenses have negative focal lengths. These lenses diverge collimated incident light. They form virtual images which are seen through the lens. They are often used to expand light or to increase focal lengths in existing systems. 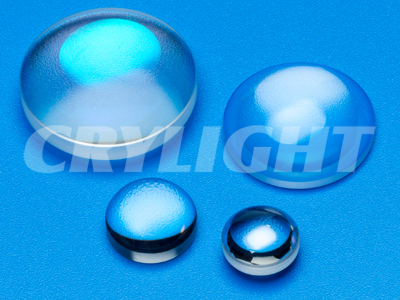 We also offer precision grade plano Convex lens with tighter manufacturing tolerances. The Plano Convex Lenses are made from CaF2 material. It presents a curved interface and a planar interface. They are for instance the microlenses situated on top of a wafer, but can also encountered in macroscopic optical systems. Their asymmetrical nature influences their properties of bending the light. Depending on their role in an optical system, their orientation has to be taken into account. The Plano Concave Lenses are made from BK7 material, which are manufactured with one concave surface and one plane surface. These lenses have negative focal lengths. These lenses diverge collimated incident light. They form virtual images which are seen through the lens. They are often used to expand light or to increase focal lengths in existing systems. We also offer precision grade plano convcave lens with tighter manufacturing tolerances. The Plano Concave lenses are made from Fused Silica material, which are manufactured with one concave surface and one plane surface. These lenses have negative focal lengths. These lenses diverge collimated incident light. They form virtual images which are seen through the lens. They are often used to expand light or to increase focal lengths in existing systems. We also offer precision grade plano convcave lens with tighter manufacturing tolerances. The Plano Concave lenses are made from Sapphire material, which are manufactured with one concave surface and one plane surface. These lenses have negative focal lengths. These lenses diverge collimated incident light. They form virtual images which are seen through the lens. They are often used to expand light or to increase focal lengths in existing systems. We also offer precision grade plano convcave lens with tighter manufacturing tolerances. The Plano Concave lens CaF2 are made from Sapphire material, which are manufactured with one concave surface and one plane surface. These lenses have negative focal lengths. These lenses diverge collimated incident light. They form virtual images which are seen through the lens. They are often used to expand light or to increase focal lengths in existing systems. We also offer precision grade plano convcave lens with tighter manufacturing tolerances. The Positive Meniscus Lenses are a convex-concave lens, but is thicker at the center than at the edges. They are felt polished and are used universally in the ophthalmic industry where convention dictates that lens power be specified in Diopters. 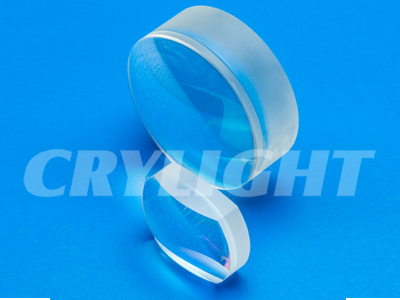 The Negative Meniscus Lenses are a convex-concave lens, but is thinner at the center than at the edges. Otherwise description is similar to Plano Concave lenses. The Double Convex Lenses are made from BK7 material, which are manufactured with an identical convex surface on both sides of the lens. The Double Convex lenses have positive focal lengths and form both real and virtual images. 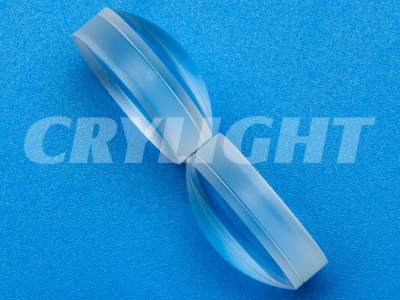 We also provide precision grade Double Convex lenses with tighter manufacturing tolerances. 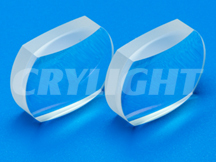 The Double Convex Lenses are made from Fused Silica material, which are manufactured with an identical convex surface on both sides of the lens. The Double Convex lenses have positive focal lengths and form both real and virtual images. 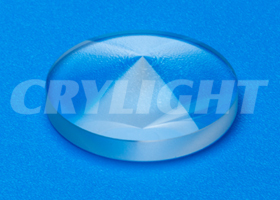 We also provide precision grade Double Convex lenses with tighter manufacturing tolerances. The Double Concave Lenses are made from BK7 material, which are manufactured with both surfaces concave. These lenses have negative focal lengths. These lenses diverge collimated incident light and form virtual images, which are seen through the lens. They are often used to expand light or increase focal lengths in existing systems. 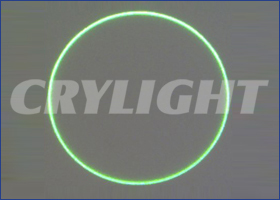 They are used in laser beam expanders, optical character readers, viewers, and projection systems. 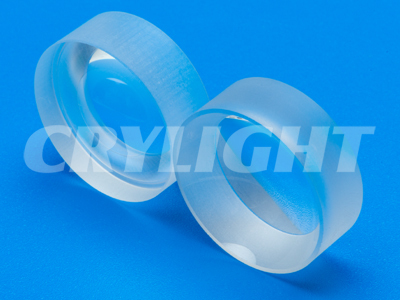 We will provide precision grade Double Concave Lenses with tighter manufacturing tolerances. 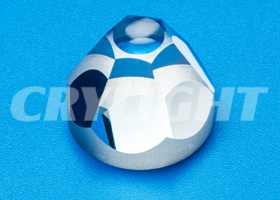 The Double Concave Lenses are made from Fused Silica material, which are manufactured with both surfaces concave. These lenses have negative focal lengths. These lenses diverge collimated incident light and form virtual images, which are seen through the lens. They are often used to expand light or increase focal lengths in existing systems. They are used in laser beam expanders, optical character readers, viewers, and projection systems. We will provide precision grade Double Concave Lenses with tighter manufacturing tolerances.